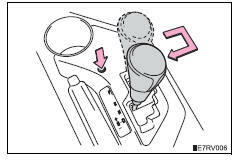 If the shift lever cannot be shifted with your foot on the brake pedal, there may be a problem with the shift lock system (a system to prevent accidental operation of the shift lever). Have the vehicle inspected by your toyota dealer immediately. 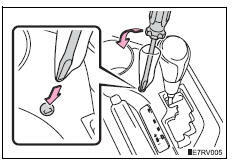 Vehicles without a smart key system: turn the engine switch to the “acc” position. Vehicles with a smart key system: turn the engine switch to accessory mode. Pry the cover up with a flathead screwdriver or equivalent tool.